I could end this review with those words and I’d be happy. I haven’t posted about yogurt in a very long time because quite frankly, dairy doesn’t seem to be agreeing with our family lately. We love dairy but dairy doesn’t always love us. Yet there I was at the grocery store and I just couldn’t leave this carton of Astro Original Natural Yogourt there. Individual containers with all the flavours that would make my palette sing, Vanilla Cream, Lemon Meringue, Key Lime, Coconut Cream, how could I NOT take it home with me? 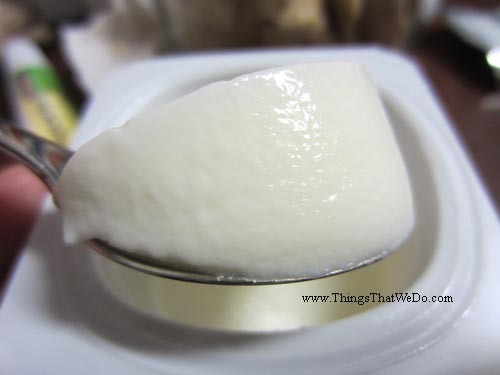 Product Review: What ingredients are in the Astro Original Natural Yogourt? The Astro Original Natural Yogourt is made with the following ingredients: skim milk, cream, sugar, skim milk powder, natural flavour, natural colour, agar, active bacterial cultures. Hey, that’s not a bad list. As far as most yogurts are concerned, the list of ingredients used to make the Astro Original Natural Yogourt is pretty decent. I can totally see that the words “natural flavour” and “natural colour” are on the list which always makes me a little weary. 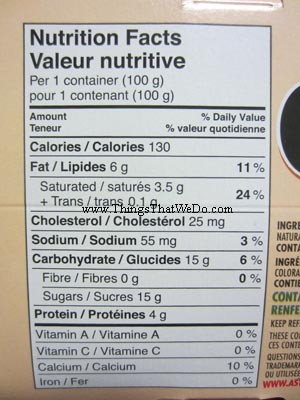 On the other hand, I’m glad it actually uses sugar instead of aspartame. I’d rather it be lower on the list or maybe honey could be used instead of sugar but hey, when I picked up this box, I was only thinking with my dessert brain and the dessert brain wins. 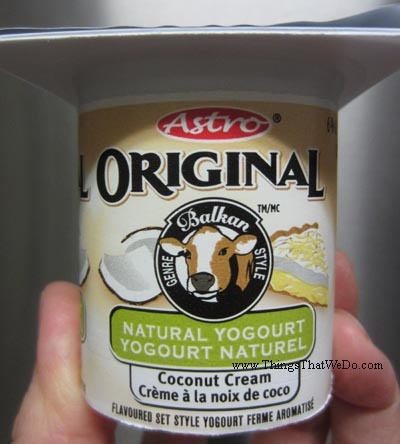 Product Review: How does the Astro Original Natural Yogourt taste? Wait, I missed a flavour. Yep, that’s all I really need to say about this pack of Astro Original Natural Yogourt that comes with those 4 super groovy flavours. The texture of each flavour holds true to the Astro brand. It’s smooth, it’s got body, and it’s so incredibly easy to eat. Each flavour SINGS and blends so well with the Astro Yogourt base. The vanilla cream has a nice subtle hint of vanilla that isn’t overpowering. Both the lemon meringue and key lime are amazing substitutes for the actual desserts but that coconut cream one is phenomenal. It has a great signature coconut flavour that pairs perfectly with the richness of the yogurt. The flavours are just really subtle, smooth, and creamy. The entire family loves this pack of Astro Original Natural Yogourt. My big kid was a huge fan of both the lemon meringue and key lime while the hubby really liked the coconut cream flavour. Me? I loved all 4. You see, too much of anything is never good. While our palettes and taste buds were enamored by the different flavours in this pack of Astro Original Natural Yogourt, our bodies didn’t. When you’re on the lactose intolerant side of life, you kind of have to be careful with what you eat. Having the Astro Original Natural Yogourt in the home certainly made it difficult to ‘live in moderation’ especially when you like ALL 4 flavours. Did we like the Astro Original Natural Yogourt? 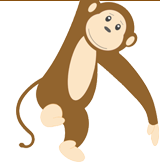 Should we buy it again? Well, we would if we could eat them all carefully but given our body’s reactions to excessive dairy, I guess the answer has to be NO and that has nothing to do with its nutritional content. Eating this yogurt just makes me happy but it’s best if I stay away from it for a while. 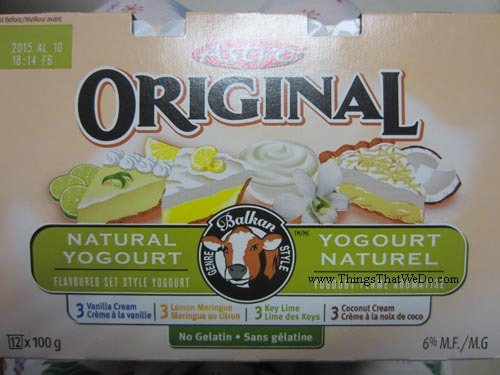 If you like mild yogurts that aren’t too sour or sweet, then you might just like all the different flavours that came in this pack of Astro Original Natural Yogourt. I know we certainly did.